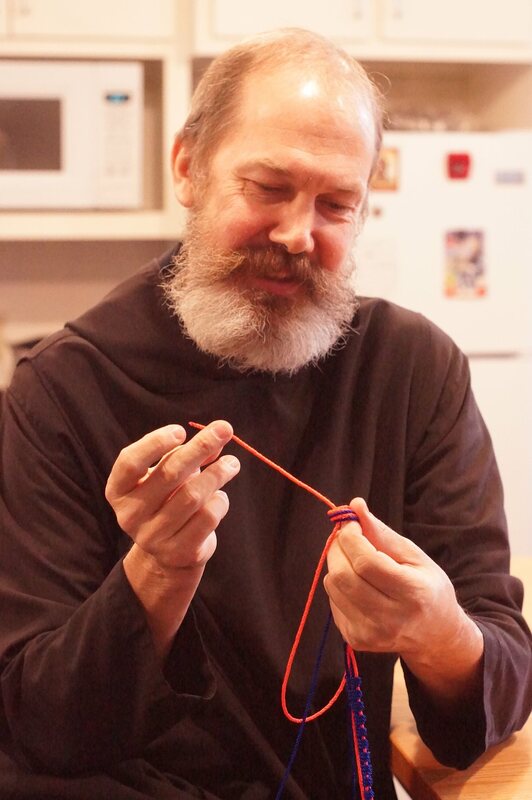 Father Reginald is from Fort Smith, Arkansas, and one of our master rosary makers. His specialty is known as "knotted rosaries" that are made with heavy duty nylon and are perfect for long term usage. He told us that he first learned to make rosaries from his Aunt Terry Olsen at the Christ the King Carnival in Fort Smith, Arkansas. She would sit at the Quilt Raffle and spend hours making them. He learned the knots from her, and then he won a DVD on how to make the double "Stranded Rosaries" on a radio game show. After countless hours of practice, his brother monks can attest that he is now a skilled artist in what he makes. As he mentioned, "It is a nice hobby to have for those times when I need to slow down and just enjoy the quiet." Today, his hobby has turned into sought-after rosaries that are sturdy and perfect for regular use, but also quite light-weight compared to the normal rosaries one might carry in their pocket. Five different colors are available depending on the person or the occasion. Our Subiaco Academy students especially like the blue and orange knotted rosaries because they are the colors of the school.